THAT’S another one in the eye for the lads! The only girl in the 15-strong field for the first leg of the Cuestars South of England Under-21 Silver Snooker Tour saw off the male opposition to claim her second winner’s trophy. 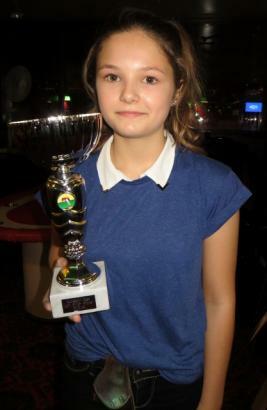 Surrey teenager Jasmine Bolsover (pictured) defeated Lewis Parnham, who hails from the South West Snooker Academy, Gloucester, 2-0 in the final at Salisbury Snooker Club. “It went really well,” declared the 14-year-old, who also won on home tables at Woking Snooker Centre last November. Despite being the only girl, Bolsover insists she’s no shrinking violet and she sent out a rallying call to female snooker players across the south. “There should be more girls playing,” she said. “I’d like to do something to get more girls playing. Bolsover topped her round-robin group on frames difference after beating Ally Pollard (Salisbury SC) and Matt Gillon (Stoke SC, Gosport), both 2-0, but losing 2-1 to Lee Fitzpatrick (Totton Recreation Club). She then saw off two other Salisbury players, Kaine Petty and Callum McDonald, 2-0 in the knockout. Sponsored by Eden Resources – a Singapore-based company that organises seminars, events and training – Bolsover plans to return to the World Ladies Billiards & Snooker Association circuit after Christmas. The second leg of eight is at Jesters Snooker Hall, Swindon, on Sunday, November 2. ROUND-ROBIN GROUP A: 1st, Joe Kitchen (Stoke SC, Gosport); 2nd, Olly Gibbs (Stoke SC, Gosport); 3rd, Abhay Chopra (Chandler’s Ford SC); 4th, Nat Kidner (Greenbaize SC, Bournemouth). ROUND-ROBIN GROUP B: 1st, Edward James (Woking SC); 2nd, Kaine Petty (Salisbury SC); 3rd, Drew Hampshire (147 SC, Swindon); 4th, Dan Compton (Copnor SC, Portsmouth). ROUND-ROBIN GROUP C: 1st, Jasmine Bolsover (Woking SC); 2nd, Lee Fitzpatrick (Totton Recreation Club); 3rd, Matt Gillon (Stoke SC, Gosport); 4th, Ally Pollard (Salisbury SC). ROUND-ROBIN GROUP D: 1st, Callum McDonald (Salisbury SC); 2nd, Lewis Parnham (SWSA, Gloucester); 3rd, Canberk Benning (Jesters, Swindon). QUARTER-FINALS (12 points): Parnham beat Kitchen 2-0, Fitzpatrick beat James 2-0, Bolsover beat Petty 2-0, McDonald beat Gibbs 2-0. SEMI-FINALS (15 points): Parnham beat Fitzpatrick 2-0, Bolsover beat McDonald 2-0. FINAL (25/18 points): Bolsover beat Parnham 2-0.